My love affair with extensions began years ago, and I’ve adored them since. Going longer can be a pretty big step and quite a commitment: the results are dependent on the type of extensions and the system used to apply them. But with a silly amount of choice out there, how do you figure out what’s right for you? and whether you can look after them. You will receive a clarifying shampoo to use before your fitting. Things to consider before fitting……. To be able to have hair extensions, your natural hair should be a minimum of 3-4 inches in length, just about long enough to put into a ponytail. Ideally, the longer your hair, the easier it is to blend the natural hair with the hair extensions. If you have given birth in the last 3 months or are pregnant, we can not apply hair extensions due to the hair thinning and hair loss that is often experienced after the baby is born. At the consultation you can decide on what hair would be best, and to get a colour match to suit your hair colour to perfection using one or more colours. If your hair has any chemical process like colour or perming, this will have to be done 4-7 days prior to having the extensions fitted. After the extensions are fitted, you will still be able to have your hair coloured, as long as care is taken to stay away from the extension bonds or you could risk needing new hair from the damage. It is advised you have this chemical process completed by a professional to obtain the longevity of the hair. If you are happy to go ahead with the hair extensions and would like to book an appointment, a non-refundable deposit is usually required. 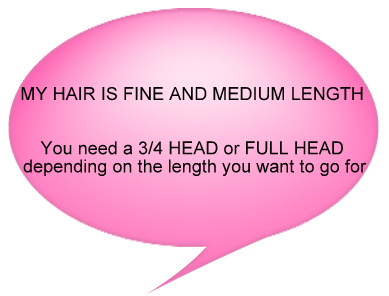 Hair extensions can take between 3 – 5 hours to apply a full head. This includes preparation of your natural hair, the application of the extensions & blending of the hair, to achieve the ultimate look you desire. After you have had your consultation and are happy to go ahead with having the extensions fitted do not dye your hair. This will effect the colour match and affect how the extensions stay in the hair. Wash your hair the day before you are due to have your extensions fitted, use only a clarifying shampoo (supplied) to completely remove any styling products or residue off your hair. Do not put any conditioner in your hair or any further products in your hair afterwards as this can cause the bonds to fail. Conditioner and other after care products coat the hair in a silky substance which can cause the bond/micro ring to not stick to your own hair and slip. Do not have your hair trimmed just before your fitting as a natural look rather than a blunt cut will blend in better with your extensions. -Upon waking, brush hair and freshen up with straighteners if necessary (heat styling is not bad for hair extensions, it will improve the appearance of the hair and make it silkier, however it is highly recommended to use a good quality hair straightener such as GHD or Cloud 9 and a heat protection spray. -Before bed brush hair with hair extension brush then apply Argan Oil into mid lengths-ends of hair. Do this every evening. Throughout the day the hair extensions are exposed to heat, wind, sun and they receive no natural nutrients from our scalp like our own hair does so it is very important to rehydrate and replenish them with treatment oil. I not recommend colouring, tint or perming the extension hair. These types of products contain elements that can damage the extension hair. Even if the hair extensions are 100% human hair, it is not receiving nutrients from the scalp like your own natural hair. The more heat you use on the hair extension the shorter the lifespan of the hair. Treat your extensions with the same respect as you would with your own natural hair. Superior aftercare and regular maintenance will keep your hair feeling and looking great for longer. The first thing that you may notice is that immediately after the installation of the extensions, and for the next day or two your scalp may feel tender. This is normal and will go away by the third day at the most. Rest assured that this is not a sign of a problem but just because of the added weight of the hair. Tie your hair back in a loose ponytail or plait using a soft scrunchie for bed. Never wear your extensions for longer than 3 months. In the 3 months of wearing your extensions your hair will have grown by approx 1.5 inches, the roots of your hair often start to tangle together if you have not separated the bonds correctly and therefore it is not healthy for the hair if left. Please Note:- Lighter Shades have a bleach content therefore will not last as long in life span as non bleached hair. The lighter shades will need extra care and less heat application to increase the lifespan. Products such as hairspray and mousse will dry out your hair extensions and can destroy them. Do not to wash your hair for at least 5 days after having your extensions fitted. This will give the bonds plenty of time to set and avoid hair shedding from the bonds later on. Before washing it is advised to detangle your extension hair with a wide tooth comb and separate the bonds. It is essential you only use shampoo and conditioner supplied by us in your aftercare pack, as any other products that haven’t been approved by your stylist may ruin the hair extensions and dry them out! Your stylist will not be held responsible for this. Extra Shampoo and conditioner can be bought by contacting us. When washing your hair, do not tip your head over the bath as this could cause tangling – always wash with your head upright – in the shower is ideal. Smooth the Blondie Locks shampoo down the extension hair – do not rub vigorously. 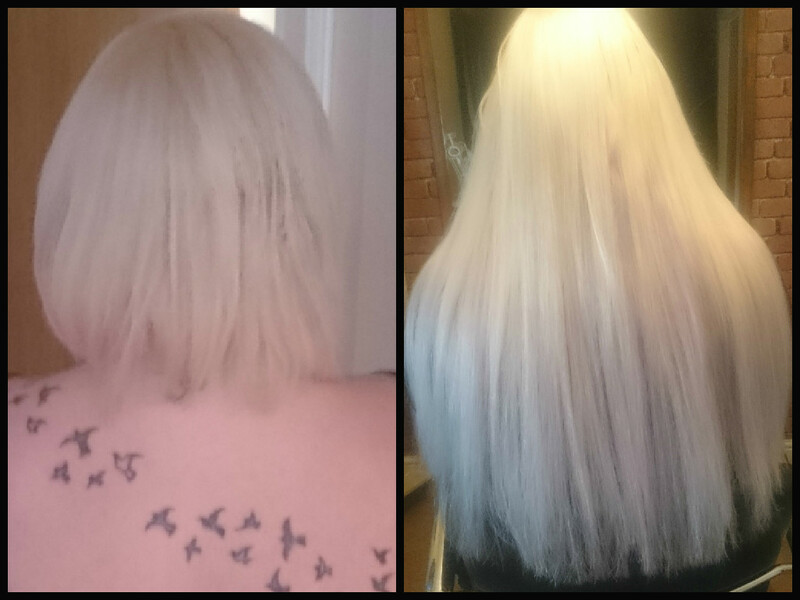 Only condition from the mid lengths to the end of the hair. Do not apply any conditioner to the bonds as this will cause slippage. You can pick the top section of your own hair up and apply condition to this section. Pat hair gently when washed – do not rub. Do not brush the hair when wet. If hair extensions dry out it is because you haven’t followed our correct aftercare and/or haven’t used recommended shampoo and conditioner. We will not be held responsible on hair being damaged. Do not use Xten/X10, it will make your hair extensions feel dry, tatty and damage the bonds. After washing with the Blondie Locks Shampoo and Conditioner, follow by detangling with a wide tooth comb, making sure you avoid the bonds. Make sure all bonds are dried completely. Be very careful when brushing the hair when wet, make sure you support the extensions hair by holding the bonds. For a sleek finish, section your hair off and blow dry using a round brush with soft bristles. Be very careful that you do not snag the bonds. Finish by using a good quality straightening iron. Heated Rollers, Straightening Irons, crimpers and tongs can all be used on the extension hair although it is advisable only to use heat protection sprays, Serums, gels etc that are recommended or supplied by your extensionist, other products may contain ingredients that may do more damage than good. Remember your extensions are attached to your own natural hair, pulling too hard or mistreating your extensions can result in your own hair being pulled out. The only brush you should use near to your extension bonds is an extension brush. When brushing the extensions always hold the bonds, making sure no additional stress is put on the hair. If you use a sunbed it is advisable to wrap the hair in a towel first. Sun beds can dry out the hair and melt the bonds. If you work out regularly or have regular use of a sauna or steam room make sure the bonds are completely dried as soon as possible after your session – leaving the bonds in a constant damp environment could cause them to deteriorate. I do not advise getting Hair Extensions if you are pregnant or for one year after having a baby as hormonal hair loss during and after pregnancy can be accelerated by wearing hair extensions. When working out or doing any exercise that can make you sweat you will need to wash your hair immediately afterwards as your bodies salt can dry your hair extensions out. Place long extension hairstyle into a braid, using a covered band. Avoid getting extension hair wet when swimming. Keep your head above the water, do not swim under water and no diving. The chlorine in pools and salt in the sea combined with heat can cause the extension hair to discolour and matt. Chlorine, pool chemicals and salt will cause the keratin bonds to break down and disintegrate which will result in the loss of the extension hair if the pre bonded or micro loop system is used as they both contain a bond or micro bond. If the extensions do get wet during this activity dry extension hair immediately after swimming, ensuring first you rinse the hair in fresh water. Do not brush extension hair when wet, dry immediately. Ensure that Extension hair is tangle free after swimming. Do not sleep with wet hair extensions, ensure they are dry before you head for bed. Do not use a sunbed while wearing hair extensions as this will dry them out. Holidays abroad in the sun will dry out extensions. I recommend you try and keep them covered this may not protect them though or remove them while abroad. The water also in different contains chemicals that are not good for the hair some hotels (places abroads) have boilers that have water softeners, the salt breaks down the bonds and drys out the hair. It is crucial that you make the most of your extensions by taking good care of them and using the correct products. Correct aftercare is just as important as fitting the extensions correctly. Many people try to save money on aftercare by watering down regular shampoo’s/conditioners etc to “make do” which can have really disastrous results such as dryness, matting and dullness in the extensions. Hair extensions are a great way to change your look but they do require some maintenance and care. Once you have had your extensions fitted your stylist will guide you through how best to look after your new hair. Hair extensions often cost a lot of money and can take a while to attach, so it is in your interest to look after them properly. With your new hair extensions you won’t need to wash your hair as much as you would normally. You shouldn’t need to wash your hair any more than twice a week as any more than this can put too much stress on the extensions due to excessive heat styling etc. It is important to only use a shampoo and conditioner recommended for hair extensions. This is because many of the standard high street brands contain high volumes of sodium chloride (salt) which will dry out your hair and silicone based ingredients which can cause the bonds to weaken and break down. Loose bonds will cause the extensions to fall out – so either way it is a lose – lose situation. You also need to keep your hair in really good condition by using a moisturising conditioner. However, you need to make sure that the conditioner does not come close to the actual bonds as this can also cause the bonds to weaken. Once you have washed your hair you need to take extra care when drying and styling it. The hair is at its weakest when wet so ensure it is dried gently and handled carefully. Hair extensions will last longer and look better for longer when properly taken care of so it is well worth taking the extra time to get it right. When brushing your hair, make sure you are using a hair extension brush as this is specifically designed for your extensions. Other brushes with balls on the ends can rip and break the hair. You need to keep your extensions tangle free by brushing your hair up to two times a day, but avoid over-brushing as this can cause unnecessary shedding. It is perfectly normal to lose some hairs when brushing, remember most people actually lose up to 100 hairs a day! You are actually doing less damage to your hair by having extensions as you aren’t using heat directly onto your own hair. The deep wave hair can be brushed when it is wet and must be left to dry naturally, as it is drying you need to twist the hair round your finger to get it back into shape. The curl last really well, if you do the correct after care the hair should last about 4 months. Previous Post How would you react to racist hate? Next Post Why I’m so ready for Autumn.